62,000 were wounded, captured or missing in action. 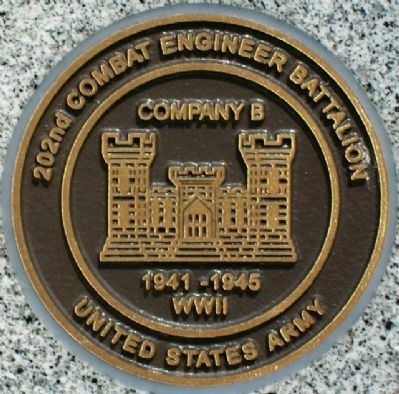 Erected by Surviving Comrades and Families of Company B, 202nd Combat Engineer Battalion. Location. 39° 30.965′ N, 84° 23.885′ W. Marker is in Middletown, Ohio, in Butler County. Marker is at the intersection of Clark Street and Manchester Avenue, on the right when traveling north on Clark Street. Touch for map. Bench is about 250 feet SW of Holy Family Catholic Church. Marker is at or near this postal address: 201 Clark Street, Middletown OH 45042, United States of America. Touch for directions. (approx. ¼ mile away); Canal Locks (approx. ¼ mile away); The Miami & Erie Canal in Middletown (approx. ¼ mile away); The Miami & Erie Canal Lift Bridge (approx. ¼ mile away); Underground Railroad Route (approx. 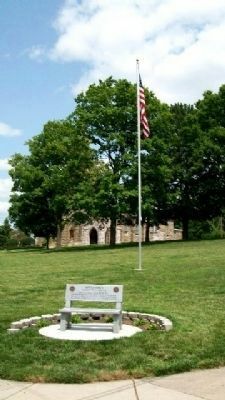 half a mile away); Middletown War Memorial Flagpole (approx. half a mile away). Touch for a list and map of all markers in Middletown. More. 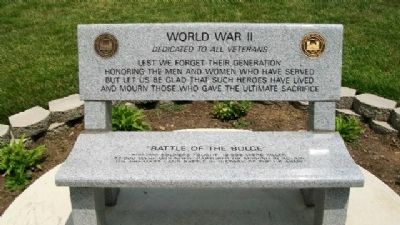 Search the internet for World War II Veterans Memorial Bench. Credits. This page was last revised on June 16, 2016. This page originally submitted on April 10, 2010, by William Fischer, Jr. of Scranton, Pennsylvania. This page has been viewed 1,203 times since then and 7 times this year. Photos: 1, 2, 3. submitted on April 10, 2010, by William Fischer, Jr. of Scranton, Pennsylvania.